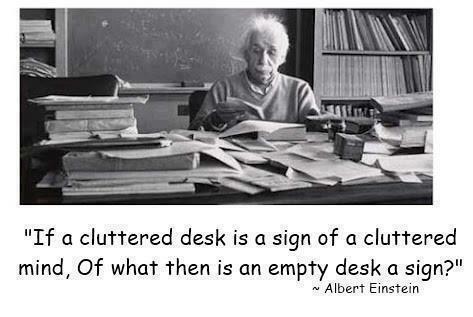 Did you know that the above is the full version of the often used quote, “a cluttered desk is a cluttered mind”? How you answer Mr. Einstein’s question? I would answer, “An empty desk is a sign of someone ready to get something done!” Are you that someone who is ready to get something done? How about starting with organizing the hub of your business: your desk? Desks seem to become cluttered right before our eyes with all of the paper, electronics and office paraphanelia that land on it every day. You can easily organize that clutter by understanding why a clear desk matters and learning the 6 easy steps to clear it out. Let’s get started by talking about the importance of a clear desk. Overall, a clear desk can make your work more enjoyable and that gives you a productivity edge that makes work feel less like work. Let’s move on to explore what supplies are needed to begin clearing the clutter. CLEAR A HOLDING AREA to house to where your removed items can be stored temporarily while you work on organizing your desk (can be a closet, wall/floor space, under the desk or area near office). Distribute: all things that have migrated to your desk, but belong in another room. NOTE: Minimize the number of things you keep on your desk; this is the optimal time to get rid of anything that will not support your goal towards efficient workflow. Remember: simplicity will make your workspace feel less cluttered, thus making it easier to work freely and accomplish more. REMOVE EVERYTHING: Continue removing, purging and sorting until NOTHING is left on your desk. EMPTY THE BOXES & CLEAN IT OFF: Empty the boxes appropriately then clean the surface of your desk and any equipment left. Take a step back and look at what you have just accomplished. YOU HAVE REACHED a clear desk. Sit in your chair and revel in how it feels. Stretch your arms out over your desk and touch the emptiness; breathe the space. It’s pretty awesome, isn’t it? When you are saturated with the feeling of accomplishment, SEND ME A COMMENT about how it feels – I’d love to hear your feedback. If you have any questions, as always, feel free to drop me a direct note. Check back for the next post in this organizing series that will help you understand the mindset shift needed to organize your desk and teach you about the categories needed to continue the process. OK! That does it! I’m always happy to give good swift kicks in the pants! 🙂 So happy to hear my words motivated you to take action. Keep up the good work and, as always, feel free to drop a line if you run into any challenges. I’m here to help others find the joy in an organized world. Thanks for the tips. I love that you gave step by step plan for clearing off a cluttered desk. Sometimes it’s difficult to move something off because we just might need it when it’s gone, but sorting in the 3 piles might help alleviate the fear of losing all our “stuff” LOL. Lynn, I’m visiting from the UBC. What a great, clear, well-written, cheerful, inspiring, productive, practical article! Wow! I’m posting you on FB! Great tips, Lynn. I recently cleared off my desk so I can work my happily in my space but stuck some paperwork in drawers that needs to be organized, sorted or tossed. Thanks for the ideas and I love the quote by Einstein. You have motivated me to keep my workspace free so that creativity can flow! 🙂 So happy to hear you found motivation through my words; that warms my heart. I have a great infographic that I will help with paper sorting (targeting later this week or beginning of next); it will be a bonus to those who sign up early for the upcoming newsletter. Cleaning off my messy desk is an on going project. I have filled up a large trash bag with shredded paper. Old utility bills, junk mail and who knows what else. Still I have only managed to clear off one little corner. Ahhh…you have just been enlightened; so glad! Organizing is not a destination, it is a journey. Remember that you have not failed to organize, you have succeeded in organizing one part of the big pie! Congratulations. Now keep doing it for 15 min. every day and I firmly believe you can see a result. If the disorganization keeps coming back, you are only changing the physical reason for the disorganization. Remember that you must change habits too, one at a time. Check back for a post on that subject soon. This is SO timely! lol. I needed a good reminder. I really agree about the part about helping with your creativity! Great tips! So glad the post came to you at the right time! I’m on a path to dispel the many myth’s about organizing; this one being that structure created by organizing stifles your creativity….t actually serves to free up your mind (and space) to inspire your creativity. Glad you connected withe message.Thanks for reading. OMG…you have no idea how much I need to read this! My entire classroom is taking over my life, a vision of how this school year has been. One of my goals this week is to get my desk CLEAN…Friday is a grading day…once grades are done..I’m on it! Thanks! I am SO glad that this post came at such a serendipitous time! I would love to hear how implmenting the steps in your classroom works out for you! I would love to help teachers organize their classrooms; it would be such a challenge! Drop me a note and let me know how things go! Love your post Lynn! I generally keep my desk fairly tidy as I have a very small space but occasionally it gets a little out of control. Sunday night is dust, sort and prioritise night ready to start the week! Once you set the system up for clearing the desk, it’s easy to reign it in when it gets even a little out of control. I’m with you; Sunday night is my time to prepare for the week ahead. I love getting everything ready to roll for the week – makes my mind free to sleep well. I love these tips! Desk clearing is taking place immediately. Thanks for reading! Hope the clearing was successful….drop a line and let me know how it worked out. I wholeheartedly agree about a clear desk. I cannot work with mess – simple. And sometimes that’s exactly the best way to look at organizing: simple and practically! Yep, I get to my office full of enthusiasm to get something done… and my heart sinks when I see my desk, then the motivation swiftly vanishes. So I’m going to clear off the monster pile of paper right now and get on with my day, thanks to your post. As always, feel free to drop me a note if you need help. You’re quite welcome! I’ll be doing posts on filing in a few weeks – don’t forget to check back for some information. Suggestion on a file cabinet: go for a 2 drawer later (horizontal) instead of a vertical; they are much easier to use and house more paper! (Assuming you have the wall space) Verticals are really deep and hard to put into a home office. Ooo…a label lover! So many people think that is an unnecessary step, but it’s so important to label everything so you can maintain the organization. Remember I’m just a click away if you need help; please feel free to contact me with any questions. I have managed to get the top of my (home) desk cleared. Now I just need to tackle the cubbies and the desk drawer. Thanks for the prompting! I look forward to visiting your blog and reading your posts too. Remember, drop a note or send me a fb message if you get stuck and need help getting out of the weeds – I’m happy to help! My work space at the office is always tidy; at home is a different story! Ahhh….I know what you mean! It’s hard to keep it all in balance. That’s why I subscribe to the mantra of “off balance on purpose”! It’s a concept written about by Dan Thurmon (same title as his book). If you get a chance, check it out; I know you’ll find something valuable in it. As always, I’m here to help if you need it; feel free to drop me a note or contact me if you need help. Thank you for your compliment; it’s my pleasure! Thank you for the compliment; you are most welcome for the tips. Hope you’ll visit often to find some more ways to bring organization into your world. That is exactly why I have moved my laptop to the kitchen table… to avoid that cluttered desk. I just ordered some cool Thirty One items and when they come in I will be able to clear everything out, and get things organized and into their correct space. I’m so glad to hear you are going to work on clearing your desk! Try not to buy too many organizing containers though until you have purged/sorted and truly know what you need to contain; otherwise the containers could easily become disorganized. 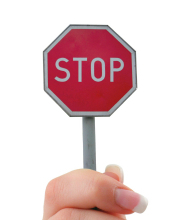 Good luck and remember that you can always drop me a note if you run into any roadblocks! I think I could follow this plan if only I could find the time……….maybe I need a time management plan! LOL! So many of us struggle with fiding the time to organize both in our homes and our office. I’ll be posting some time management tips soon for you to use, but in the meantime, here’s a thought – whenever you feel you don’t have enough time for something, turn the coin over: Think about what the disorganization is costing you; isn’t it worth taking the time to eradicate the cause? Food for thought! Ahhh…the pile syndrome! It’s our nemesis isn’t it? Forgive yourself your piling ways, though….you’ve won a bigger battle – you throw things out! That’s a major accomplishment. Keep on working at keeping that desk clear – it’s worth it.